Although I might take a break from Reno 9 1 1 and allow the season premiere of the "The Office". Although I just found out that Salt-N-Pepa have a VH-! reality show starting soon. No mention of Spinderella. "Salt is angry about being unappreciated when they were together and Pepa blames Salt for breaking up the group." Shoop! Although, The Office - yeah!I There's an Office Season Premiere Party here tonight. It includes an exclusive guest list of one mother and one daughter, uncorking an adult beverage and sending a semi-disabled husband out to pick up some take-out tempura and edamame. Also, he is not to attempt conversation until the show is over. Smell 'Em - Mrs. Obama Reveals Her Husband Is Snore-y and Stinky. Duh. The NYT reports this as news - don't they know any other men? Aren't they all snore-y and stinky? Maybe Mrs. O is just making a pre-emptive move to scare Oprah away. Read 'Em. 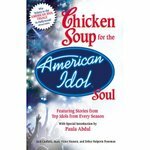 Chicken Soup for the American Idol Soul. "Stories from the Idols and their Fans that Open Your Heart and Make Your Soul"
#1- If you need this to create a soul for you, then I just don't know. #2- Introduction by Paula Abdul? The mind boggles. #3- Hold up a 10 and a 5 and light it on fire. I suspect that you'll get more entertainment from that than from spending it on this "book". See 'Em. 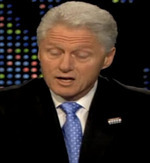 BJ CLinton on the talk show circuit this week. The old boy is losing his sparkle. Now he's like your old Uncle Bill, rambling on with the same old stories in the corner of the family party, telling his own version of past events despite the fact that his audience was there and knows what really happened. I have to admit that the always had a golden tongue and could mesmerize any audience, but he seems to be slower and less focused. .Still a lying self-promoter, though.